During the winter months, December through March, Crystal River boasts the largest manatee population and is the only place in the world that you can swim with the manatees. Many people come here to snorkel because of the large manatee population that migrate up into the warm natural spring fed waters that remain a constant 72 degrees all year round. Yes, 72 degrees year round, so you will want to bring your wetsuit. 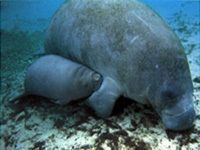 Crystal River Manatee tours are a great experience for the whole family. Come and play with the manatee it is a great time whether you sit on the boat and watch, or get in the water and snorkel with them. It will be a memory you will cherish the rest of you days here on earth. Manatees are one of natures most fascinating creatures. Gentle for their size they love to have contact with humans. While swimming with these gentle giants is prohibited almost everywhere else, at Crystal River, Florida humans and manatees can have a relationship that few attractions in the world can offer. In Crystal River you will have the chance to get in the water and spend time with these animals on a personal level. When you first arrive you will be shown a video of what you may and may not do with the manatee. This way there is no surprises after you get in the water and are having fun with them. Just remember they are wild animals and you are not allowed to keep them from eating or their natural behavior. If they want to interact with you, and they will, they will come and tell to get over here and pet me and play with me I am bored. They do love to play with people. If you don't think so now, ask yourself after you get out of the water, did you play with them or did they play with you? 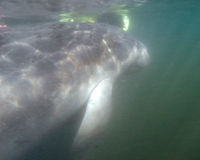 Manatees love cameras, so if you are going to be around them make sure that you have one on hand as they love to roll and play for the picture. Many people who have taken a manatee tour will agree that the pictures you will get of the manatee are worth it. We offer several types of manatee tours, including morning tours, private tours and large group tours (maximum 16 people). Dive Operator: We will be diving with Crystal Lodge Dive Center on their specially designed snorkeling pontoon boats. The minimum group size is 4 and the maximum group size is 16. Space fills up fast so contact us or sign-up online so we can reserve space on the trip. Location: Crystal River, FL is located on the West coast (gulf side) of Florida approximately 1.5 hours (75 miles) Northwest of Tampa and approximately 2.0 hours (100 miles) Northwest of Orlando. Click here to download printable driving directions to Crystal River, FL. Trip Dates: This dive charter is offered from December through March. See our Travel Page for our next dive trip. 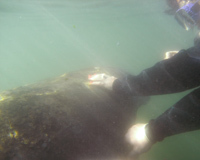 If you do not see a manatees trip scheduled, please contact us and we will setup a trip for you. Meals: Meals are NOT included. The hotel offers a continental breakfast or you are free to find something on your own. If people would like to relax and visit and reminisce about the activities enjoyed during the day before heading home, we could all meet at the restaurant next door to the dive lodge. The restaurant offers outdoor dinning, nice music, great atmosphere, and is beach side. Trip Costs: Save 10% ($5) if you sign-up for both the morning and afternoon snorkel tours. You should arrive about 1/2 hour before departure time and unload your personal gear and complete release forms and watch a short required video on the protection of manatees. On all snorkel tours there will be complimentary bottled water, soft drinks, and snacks for your convenience. The prices below DO NOT include crew tips or personal snorkel equipment. If necessary, we can arrange equipment rental for you. However, we need to know what equipment you need to rent at the time of your reservation. Deposit: A 25% deposit of your total package (snorkel tours, rental gear) is required at the time of booking. The remaining trip balance (snorkel tours, rental gear) MUST be paid in full 15 days prior to trip date. Forms Required: Everyone will need to complete the Liability Release for Boat or Excursion form prior to entering the water.